Former Barnsley, Swansea and Plymouth goalkeeper Kyle Letheren will not be joining Motherwell after the SPL blocked his transfer. Kyle Letheren won’t be joining Motherwell after the Scottish Premier League knocked back a request from the club to bring the goalkeeper in as emergency cover. The former Swansea City, Barnsley and Plymouth Argyle player had agreed terms to sign on at Fir Park until the end of the season. 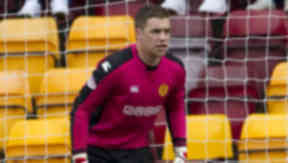 Injury to on-loan Everton keeper John Ruddy has prompted Craig Brown to bring in Letheren, who had trained with Motherwell earlier in the season, as cover to current number two Michael Fraser. Under SPL rules, all players must be registered by March 31 to compete in the remainder of the season’s fixtures. But clubs can apply to bring in a goalkeeper as emergency cover at any time, with the league having the final say on whether the request is valid. Despite Ruddy’s absence, the SPL rejected Well’s attempts to bring in the Welshman on the basis that their two youth goalkeepers – Ross Hyslop and Shaun Thomson – were signed on professional contracts and were fit to play for the first team. As a result, the deal for Letheren is off and one of the two youngsters will be understudy to former Inverness goalie Fraser at Celtic Park on Tuesday night. Letheren, 22, who is a former international with the Welsh under-21 squad, started his career at Swansea but failed to make a single top team appearance. A move to Barnsley followed in 2006 and played once, coming on as a substitute in an FA Cup match with Blackpool. A loan deal with Doncaster Rovers followed before he was released from Oakwell and he signed a short-term deal with Plymouth at the start of the season. He was subsequently released from Home Park having not played a single game.